This comprehensive best-seller is aimed at readers with little or no programming experience. It teaches by presenting the concepts in the context of full working programs and takes an early-objects approach. 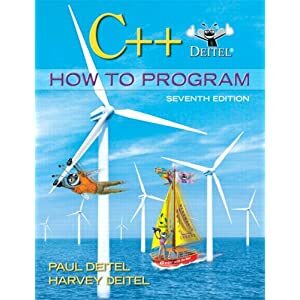 The authors emphasize achieving program clarity through structured and object-oriented programming, software reuse and component-oriented software construction. Introduction to Computers, the Internet and World Wide Web; Introduction to C++ Programming; Introduction to Classes and Objects; Control Statements: Part 1; Control Statements: Part 2; Functions and an Introduction to Recursion; Arrays and Vectors; Pointers and Pointer-Based Strings; Classes: A Deeper Look, Part 1; Classes: A Deeper Look, Part 2; Object-Oriented Programming: Inheritance; Object-Oriented Programming: Polymorphism; (Optional) ATM Case Study, Part 1: Object-Oriented Design with the UML; (Optional) ATM Case Study, Part 2: Implementing an Object-Oriented Design; Exception Handling; Templates; Operator Overloading; String and Array Objects; String Processing with Class string; Stream Input/Output; File and String Stream Processing; Searching and Sorting; Data Structures; Standard Template Library (STL); Bits, Characters, C-Strings and structs; Game Programming with Ogre; Boost Libraries, Technical Report 1 and C++0x; Other Topics; Operator Precedence and Associativity Chart; ASCII Character Set; Fundamental Types; Number Systems; C Legacy Code Topics; Preprocessor; UML 2: Additional Diagram Types; Using the Visual Studio® 2008 Debugger; Using the GNU™ C++ Debugger. This is a very useful reference for programmers.